Previously I discussed the Vatican in Rome and Jerusalem in Israel, two of the sacred places of the major world's religions, that Susan Quinn had visited on a great world tour. In this section I will focus on the rest of her three week tour. It took me about 40 years to final get to and explore these interesting sites. I will start with India, a country with many holy places. Quinn went first to Sarnath, the Buddhist holy city where Buddha attained enlightenment. There are temples to him. Here Quinn began to appreciate what the trip was doing for her attitude toward religion. She could and would have access to it all. After the chaos of the rest of India, I found Sarnath the quietest. It was the most peaceful place I had been; few beggars, little traffic. 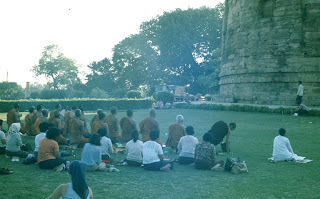 I was there on a religious occasion and monks were everywhere, and I was able to watch a ceremony at one of the monuments. Buddhism was pushed out of India by Hinduism and became a major religion in Japan, China, Tibet, and Thailand. Quinn found India's holiest city Varanasi and Ganges River where they wash their sins away-filthy, I agree. 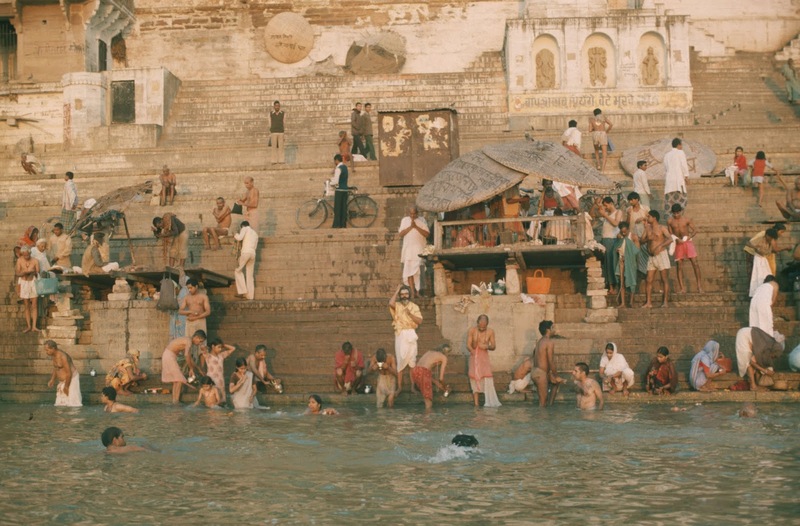 She rode a boat along the shore watching the bodies being burned on the ghats or steps. She was upset by the suffering of the mourners and when she got home talked her husband out of his desire to be cremated upon his death. Varanasi is the holiest of the seven sacred cities for Hindus, a religion that is thousands of years old. 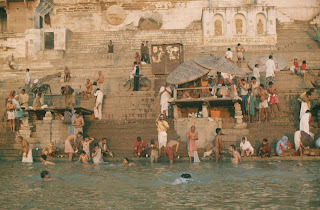 People come here to die and have their bodies burned on the Ghats so they can stop the cycle of constantly rebirth and reach nirvana. The city is loaded with temples and there is a claim that this is the oldest living city in the world. Shop keepers with whom I had tea on two occasions asked if they could share a story. One was the story of Ramayana, which sounded like something out of the brothers Grimm. The tale teller laughed hardily and became very excited. Afterwards a guide took us to a ceremony where over a hundred men in yellow robes chanted and sang while pilgrims circled the chanters. Ganges River in Varanasi where Hindus wash their sins away. Several of us from my group got up early to watch bodies being burned on the Ghats. We were able to see the preparation, the burning and the discard of the remains into the Ganges. We were again reassured that the Ganges destroys bacteria upon contact and destroys bones in three days. Kyoto, Japan, is the capital of Zen Buddhism the concepts of which resonated with Quinn, and she had a truly spiritual experience. Its emphasis on nature, beauty, and gratitude led her to mediate every day since she was there. The basic rules are simple. In a silent place sit quietly, and let go of your thoughts. Focus just on your posture and your breathing. Keep your back straight. Release your ego and your unconscious mind and them melt away. Merge with the universe. When I was traveling with a group of psychologists, several of whom felt that Zen Buddhism meditation was a much better treatment for addiction for some people then Christian based AA. Meditation continues to be a part of some therapists treatment package. I visited many shines in Kyoto, one of the most beautiful cities I have visited in the world. The U.S. did not bomb Kyoto during the war because they had no war plants here. The most impressive place we visited was the Zen Temple, the Golden Pavilion with the top two floors covered in gold leaf, with a beautiful pond and surrounding gardens. I bought a large photo the Temple for framing and it hangs in one of our bedrooms. Quinn next went to two places I have not been, Lhasa, Tibet, and Addis Ababa. She liked much about Tibet and struggled with some of the concepts. For example, "the only way to alleviate suffering is not to want." She didn't get to the holy place in Addis Ababa and went next to Cairo, Egypt. 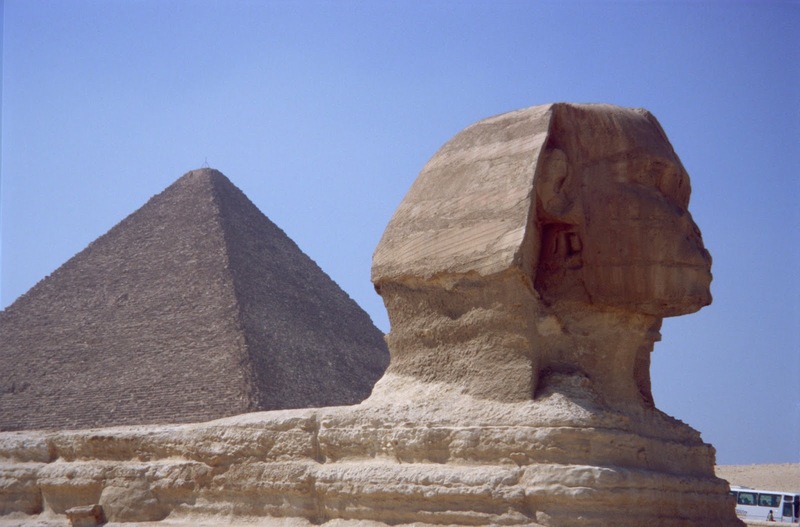 She found the pyramids and the Sphinx disappointments. They were dirty, disintegrating and surrounded by beggars. She wondered what the sun gods were thinking. I too was disappointed when I saw what number 1 on the Hillman World Wonders list was like in person. I found many other places in Egypt more interesting. While Quinn goes on to Istanbul, the last stop she talks about is Yerevan, Armenia (officially still Turkey) to see the sacred mountain of Armenia, Mount Ararat. What did she learn from her trip? "I saw that there were so many ways to practice one's faith, and that they should all be respected." The people on the trip with her were astounded by the similarities in basic tenets of the religions, even though the rituals might be different. I also appreciate that my adventures have allowed me to visit most of the major religious sites around the world.